Maya Younger and her identical twin sister, Nikki, have always agreed on the important things. Friends. Boys. School. They even plan to attend the same historically African American college. But nothing can always remain the same. 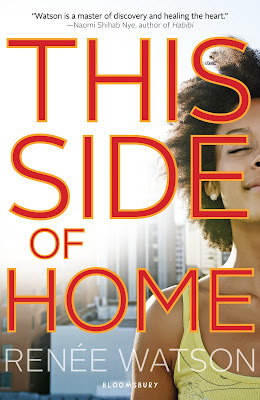 As their Portland neighborhood goes from rough-and-tumble to up and coming, Maya feels her connection to Nikki and their community slipping away. Nikki spends more time at trendy coffee shops than backyard barbecues, and their new high school principal is more committed to erasing the neighborhood's ghetto reputation than honoring its history. Home doesn't feel like home anymore. As Maya struggles to hold on to her black heritage, she begins to wonder with whom, or where she belongs. Does growing up have to mean growing apart? Senior Maya Younger is a remarkable young woman, articulate, intelligent and ambitious. Identical siblings Maya and Nikki aspire to attend Spelman College, a historically black liberal arts college for women. The Portland neighbourhood is evolving, a predominantly black community displaced by white residents and corporate franchise stores. They've painted and planted and made beauty out of decaying dreams. Block after block, strangers kept coming to Jackson Avenue, kept coming and changing and remaking and adding on to and taking away from. Best friend and neighbour Essence is forced from the rental property she shares with her alcohol dependant mother, the landlord an opportunistic man exploiting the real estate demand. Another white family are now residents within the Portland community while her suburban school begins to diversify. Maya's frustration was palpable. Her community flourishing black family homes are being acquired and businesses financially constrained while residents acclimatise. Maya has inherited her parental legacy, her mother and father community activists while encouraging Maya to uphold her ideals. As Maya and Nikki form a tentative friendship with new neighbours, Nikki is thriving, exploring the contention of Caucasians encroaching on black communities. As senior president, Maya will collaborate with the new principle who is determined to innovate and positively influence education for all students. As Richmond tradition, the school celebrates Black History Month but as the new diversification has been introduced, African American students will celebrate diversity. The principal seemed awfully misguided. While attempting to promote inclusion, he erased the cultural signification of black teens and as a black educator he was inconsiderate and dismissive. Instinctive prejudice and stereotyping of the African American community is predominant within the Portland suburb and touches upon black residents campaigning for community safety, beautification and infrastructure. Landlords evicting tenants from debilitated homes, refurbishing to satisfy white families. The community seems reluctantly accepting of the suburb transformation, Nikki in particular and Maya begins to challenge her sister and her ideals, causing a fracture within their relationship. A point of contention is the flourishing interracial relationship between Maya and new neighbour Tony, shortly after her dissolving relationship with Devin. And women throughout our neighborhood pull me aside, saying things like, "I'm glad he's dating you and not one of them." And by them they either mean a white girl or hood girl. Although Tony is attentive and considerate, Maya experiences a sense of expectations within the wider community. Her concern of being hypocritical, dating a Caucasian Tony in contrast to diversifying her Portland town with the influx of white families. While at Richmond, white and Hispanic students are instrumental in a new diversity inclusion policy, at the detriment of black students and Black History Month. It raises the discussion of marginalisation and the erasure of racial identities in favour of inclusion. Inclusion is paramount in creating safe spaces especially with adolescents but the cultural and historical significance of Black History Month in particular should be celebrated. Black teens should be celebrated. One month per year shouldn't be infringed upon. This Side Of Home is an intelligent read, wonderfully diverse and encourages discussion about cultural significance and inclusion. Compelling, compassionate reading. It's such a brilliant read. I wasn't sure whether to read it as I've tired of contemporaries lately but it was incredible. A wonderfully passionate read. This sounds like a good read. I'm glad that it focused well on the importance of inclusion - but of course not forgetting one's heritage, etc. It was so charming Lauren, I've enjoyed her previous books but was still surprised how much I enjoyed it. Really captivating. Ooh! I have this one on my Kindle. I can't wait to read it. Yes Karen! It's such a brilliant read and can't wait to see what you think of it! It was amazing Haniya and so wonderfully written. Such an important conversation to have in the currently climate, of how to support and promote inclusion without racial erasure. This sounds like a powerful read -- I hadn't heard of it before -- wonderful review Kelly! Thanks Verushka. It's one that I hope all young adult readers will pick up a copy, such powerful messages and a compelling storyline. "And women throughout our neighborhood pull me aside, saying things like, "I'm glad he's dating you and not one of them." And by them they either mean a white girl or hood girl." It was so enlightening and really highlighted the importance of inclusion without erasure. I love it's passion and diversity. Such a wonderful read. Ah that's something that's been rarely brought up when discussing inclusion, isn't it? The 'erasure of identities' for the sake of community and harmony. That's quite the conundrum that I don't think many authors would dare bring up. Props to Renee Watson. It really is Joy. I think even using umbrella terms can also lend a hand in erasure too as some people may not be comfortable using a term that described all non white people. In Australia we tend not to use umbrella terms, we would describe someone as Lebanese Australian or Chinese Australian. I think it's just as important to acknowledge someone's ancestry. Renee Watson wrote a wonderful narrative and something I think we can all take from and learn. It's such a quiet achiever. I hadn't heard about it until the lovely Bloomsbury had sent me a copy to review and I absolutely loved it. So passionate and relevant. This sounds like such a wonderful diverse contempary. Great review! Thanks Megan. I'd urge all young adult readers to pick up a copy, it's wonderful and a great way to raise discussions about inclusion with teens. I've had this on my GR TBR but I haven't actually heard too much about it. Glad that you seemed to really enjoy it! I love reading diverse fiction, and reading about different cultures, but I don't think I've really read many books written in the perspective of an African-American young adult.